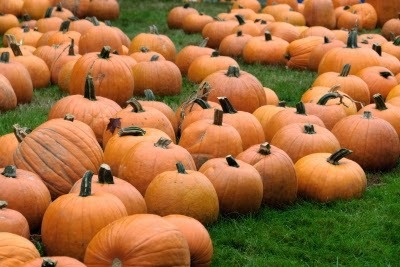 I'm loving the changing leaves, the snuggly blankets and the emergence of pumpkins everywhere you look. There's just one thing. In Germany, you can't buy pumpkin pie. In fact, when I mention it here, most everyone thinks it sounds absolutely disgusting...as if I would suggest they eat brussel sprout pie. Anyway, it doesn't bother me that I can't buy pumpkin pie in Germany, because homemade pie tastes world's better anyway. Buy a pumpkin, or if you can't find a pumpkin (starting mid-November, just before Thanksgiving, they seem to disappear where I live), butternut squash works well. Sometimes the color's a little more yellow than orange, but the flavor is good. Peel the pumpkin, remove the seeds, cut it in chunks and boil it in water until soft. I've heard some people prefer to steam it. Drain and puree. Mix all dry ingredients in a bowl. Beat eggs. Combine pumpkin, eggs and dry ingredients. Gradually stir in evaporated milk. Pour into two pie crusts. Bake in a preheated oven at 425°F/220°C for 15 minutes. Reduce temperature to 350°F/180°C and bake for 40-50 minutes or until a knife inserted near the center comes out clean. Cool on a wire rack for two hours. Okay, there are plenty of examples of pie crust recipes out there. But let's say you're lazy like me. Or you don't have enough room to roll out your crust. I found this wonderful no-roll pie crust recipe somewhere on the internet (if it's yours, contact me and I'll gladly give you credit). I admit I haven't managed to make the edge quite as pretty as a rolled pie crust, but if taste is your only important thing, you're okay with the no-roll version. Mix all ingredients. Dump dough into pan and press out with your fingers. You can decorate the edges with the tines of a fork. Fill & bake. If baking without filling, poke holes all over it first. Bake 10-12 min at 400°F/220°C. Watch it during this time. Bubbles can form, and you might have to poke additional holes during baking. If you try either recipe, I'd love to know how it turned out. And if you're an expat, what hoops do you jump through to make something with ingredients not readily available in your location? OMG. I need to do this! I was just thinking ... "hmm what should I do with my butternut squash" Now craving pumpkin pie! We did a Thanksgiving celebration last year for our Aussie/British friends here and the pumpkin pie was the big hit. For our gluten-free friends we also did a polenta-based crust, and that actually turned out really well. The corn/pumpkin combo was super tasty. It was really funny last year in the grocery stores a few days before Thanksgiving. It was so easy to pick out the Americans, because we were all wandering the same aisles with a dazed look on our face, wondering where the heck the cranberry sauce was, and what to do without the Pepperidge Farm stuffing mix base. It was fun exchanging tips with one another. Certain stores seemed to stock things where others didn't. I finally tracked down cranberry sauce by the salad dressing in one of the five stores I visited! Carissa, glad you stopped by! I'm going to have to get the polenta crust recipe from you. You have cranberry sauce? If we're lucky, I can find tiny bags of fresh cranberries for about 5 EUR/bag and make it myself. And then steam when my kids push it around and whining about not wanting to eat it. Just after posting this, my MIL gave me a pumpkin from her garden, so it loosk like I need to make some pies too. Yum!